Even if you don't know much about cricket, you may know that a small yellow book called Wisden has been around for a while... Some in the cricket world refer to it as 'the Bible'… You may also know that, despite being an annual publication in the age of instant comment, Wisden still has a bit of clout, which says plenty for the acumen of previous editors. Then there are the Five Cricketers of the Year, the selection of whom has been the sole prerogative of the editor since 1889, give or take the occasional break for a world war. Booth, the 16th editor of the Wisden Cricketers’ Almanack in 149 years has just chosen his first Five Cricketers of the Year, a responsibility that rests squarely on the shoulders of the editor of cricket’s bible and often divides punters and pundits alike. There are few more prestigious honours in our great game than a spot in Wisden’s five – it’s the oldest individual award in cricket. The award is recognition of a player’s influence on the last English summer, though it need not be at international level, and can only be awarded to any cricketer once. As Booth (@the_topspin) noted in response to a tweet - it has to be in England, I’m afraid (unless the criteria are changed!) – time will tell. With the selection of Cook and Bresnan in his five, of the 13 cricketers England used in the recent tests in Sri Lanka only Steven Finn and Samit Patel are yet to receive the prestigious honour – to quote an oft used phrase, it ‘just wouldn’t be cricket’ if the five chosen for 2013’s 150th edition contained no English internationals. Through 2000 to 2003, editors Engel, Wright and de Lisle altered the criteria and the award was made based on players' impact on cricket worldwide. In 2004, at the start of his second reign as editor Matthew Engel reversed his earlier decision but introduced a separate Wisden Leading Cricketer in the World award to recognise global achievements. The tradition began in 1889 when then editor Charles Pardon named the Six Great Bowlers of the Year. In the following edition he named the Nine Great Batsmen of the Year. However, from 1901 forward five has always been the number, though until, and including, 1920 the five were awarded not just as Cricketers of the Year but all-round cricketers, wicket-keepers and young batsmen, among others. At the height of Britain’s involvement in the first World War little cricket was played so school cricketers filled the five in 1918 and 1919 – a great honour for a group of young men who batted more regularly than they shaved. Strictly speaking my assertion of the five is incorrect. On four occasions Wisden broke with tradition and gave just one cricketer the yearly honour - Plum Warner, Sir Jack Hobbs, W G Grace and the founder of the great book; John Wisden himself. Warner and Hobbs remain the only cricketers to have been named twice – an honour befitting their impact on the English game. From 1927 until 2010, five cricketers were chosen for each edition. In 2011, only four were chosen as the fifth selection became untenable when he was banned for corruption. There have been other notable anomalies in Wisden’s history – for eight editions during the war years (1916-17 and 1941-46), no five were named. Similarly, Sanath Jayasuriya was chosen as one of 1997’s cricketers though he didn’t play in the English season – Matthew Engel deemed his exploits in inspiring Sri Lanka to World Cup victory on the sub-continent in 1996 merited his place. The biggest break with tradition in the modern era though was the naming of Englishwoman Claire Taylor as one of the 2009 appointees – a reward richly deserved and one that showed cricket’s bible was continuing to move with the times, recognising cricketing talent not gender boundaries. So, what of New Zealand’s influence on the cricketers named in sports most famous yellow tome? In a number now totalling well in excess of 300, the land of the long white cloud has produced 12 cricketers who have graced Wisden’s most famous pages. For a country similar in size to Sydney, Australia (or the counties of Kent, Essex and Hampshire), New Zealand has produced some exceptional cricketing talent who have left an indelible mark on our great game. There are a couple more with strong links to a country more famous for its rugby – one showed a strong resemblance to arguably our greatest; Sir Richard Hadlee. From Roger Blunt to Chris Cairns I have broken the stories of New Zealand’s 12 into three separate pieces to ensure I do justice to the exploits of each of these magnificent and influential Kiwi cricketers. First up I’ll look at the trailblazers of the game we love so much. Subsequent posts will cover a period when New Zealand cricket achieved more firsts than Phar Lap (he’s ours, Australia - hands off!) and when we then began to truly compete on the international arena. Blunt was named as one of Wisden’s Cricketers of the Year in 1928, prior to New Zealand being awarded test status. Our first recipient was honoured on the back of a fantastic tour to England during the 1927 first class season – his country’s first visit to the spiritual home of cricket as a cricketing nation. During the tour Blunt compiled in excess of 1500 runs and took 78 wickets with his leg-breaks (and a fine googly). New Zealand did not gain test status until January 1930, playing their first (3-day) test against England at Christchurch’s Lancaster Park – if the 11 debutants were listed in alphabetic order Blunt would have been Black Cap number two. A stylish right-handed batsman Blunt was an orthodox technician who was severe on anything overpitched. In that celebrated first test he top-scored for the home side with 45 and showed what he had to offer at the highest level, adding to the immense promise he had shown three years earlier in England. The following year he played in New Zealand’s first test abroad at Lord’s, falling four short of what would have been a well-deserved century and seen his name forever etched on the Lord’s honours board. Of his nine tests seven were against the might of England, though he finished his test career against South Africa at Wellington early in 1932. Blunt began his first class carer in 1917 as a leg-break bowler but quickly found his niche as a more proficient batsman until he closed doors on his career in 1934. His 7953 runs, at a touch over 40, remained the highest career aggregate in New Zealand first-class cricket until it was surpassed by Bert Sutcliffe in 1953. His first-class career was capped when he hit 338 not out for Otago against Canterbury in the Plunket Shield – one of only five New Zealand first class triple centurions. In addition to his prodigious batting record he captured over 200 first class wickets. Roger Charles Blunt was awarded an MBE the year before his death in 1966. In 2011 the Otago Cricket Association named him in their best XI of all time, alongside other Wisden Cricketers of the Year John Reid, Bert Sutcliffe and Glenn Turner. At that time, Dempster was regarded as the best player of slow bowling in the world. He was incredibly quick on his feet. Awarded his Wisden honour for his exploits during New Zealand’s tour of England in 1931, Stewie Dempster hit seven centuries during an archetypal wet and cold English summer. During the tour he was often relied upon to set the tone for New Zealand and at times that reliance was too high. Whilst he was able to alter his method to any situation, he seldom displayed the aggressive (read: reckless) nature of modern batsmen. Dempster could play around the wicket though it was noted he was another who was powerful off the front foot through the offside. His fleet of foot made him one of the games pre-eminent players of slow bowling especially on damp wickets. Whilst Dempster didn’t play in the second test due to a leg injury he still amassed 1778 runs at a shade over 59 on wet turners under a backdrop of damp grey skies. Like Blunt, Dempster was a key member of New Zealand’s first tour to England in 1927 – he topped the Kiwis’ batting lists. Dempster once made the point that prior to the tour he had received no formal coaching – an intriguing insight when considered against the technically over-coached cricketers of the current generation. He achieved a number of New Zealand test cricket firsts: Dempster played in New Zealand’s first test against England in 1930, hit his country’s maiden test century in the second test of that series and then stroked New Zealand’s first hundred at Lord’s in 1931 after a first innings half-century. His first century at home was part of an opening stand of 276 - a record that stood for over 40 years. It wasn’t surpassed until Glenn Turner and Terry Jarvis amassed 376 against the Windies in 1972! Eight of Dempster’s ten tests were against England, where he emigrated after drawing the curtain on his test career in 1933 at just 29. In a first-class career spanning 28 years Dempster hit over 12,000 runs at a strong average of 45. He spent time with Leicestershire after he left New Zealand, and captained the side from 1936 to 1938 – in each of those three years he also topped his side’s batting averages. Twice in his illustrious county career he hit centuries in three consecutive first class innings, finishing his stint with a few games for Warwickshire after World War Two before returning to New Zealand. Even today, more than 60 years after he unbuckled his pads for the final time, Dempster is considered one of New Zealand’s finest batsmen. Of those who played 10 tests or more he has the second highest average in test history – only The Don sits before him. It is neither fashionable nor always politic to exalt the individual above the team, but in the Test matches between England and New Zealand here in summer 1949 there was one man above all others who stood between England and victory, and that was the left-handed batsman, Martin Paterson Donnelly. Though he averaged in excess of 50 in his seven tests, Martin Donnelly’s accolade as one Hubert Preston’s Five Cricketers of the Year in the 1948 Wisden was for his exploits as captain of Oxford University in the 1947 English summer. At that time Donnelly was widely acclaimed as the game’s greatest modern left hand batsmen. His aggregate of 1,144, with three centuries, and an average closing in on 70 showed the way for his young side. In the same year he hit 162 not out for Gentlemen against Players at Lord’s in just three hours – a knock he referred to as one of his most enjoyable. That innings would form part of a rare treble two years later when he resumed international duty at the home of cricket. In a quirk he also represented England in rugby union in 1947, earning his solitary international cap against Ireland, though the result was famous for only one side, and they didn’t wear white! Born in Ngaruawahia; a small Waikato town better known for producing prodigious rugby league talent than cricketing royalty, Martin Donnelly was one of those rare cricketers who never looked hurried, playing the ball as late as possible and hitting it under his eyes. He shone from the moment he made his first-class debut as a wide-eyed 19 year old in 1936. After just one match he was selected to tour England in 1937 - with 1,414 runs at 37.21 he finished second in the batting figures amongst his more experienced contemporaries. He began his test career falling LBW for a duck; Len Hutton also debuted and achieved the same score. Donnelly fared a little better with 21 in the second innings batting at nine. In his next visit to the home of cricket in a black cap 12 years later, he struck a faultless double hundred. Nicknamed Squib due to his immense power and timing from such a small frame, Donnelly only represented his country in seven tests as he spent the majority of his cricketing career domiciled in England and was hence unavailable to tour outside of the British Isles. Of his 131 first class matches only 13 were played in NZ, for both Wellington and Canterbury. Donnelly played in only two test series’, separated by 12 years – 1937 and 1949. After the outbreak of the Second World War Donnelly volunteered for military service, joining the Army early in 1940. At the conclusion of the Allied war effort hey relocated to England where he read history at Oxford, representing them in both rugby and cricket. During New Zealand’s 1949 tour to England, all four three day tests were drawn as Donnelly and Bert Sutcliffe showed New Zealand had the growing talent to compete at international level. 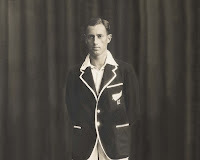 New Zealand born veteran cricketer writer Trevor Chesterfield noted (in 1999) that Donnelly created ‘images of greatness and calm, stoic Kiwi charm which graced the county grounds of England with his left-handed perfection in those early years after World War II’ – Chesterfield spent a large part of the 1949 New Zealand winter listening to Donnelly’s exploits in mother England in the middle of the night whilst attending boarding school. During that tour Donnelly struck a magnificent 206 in the Lord’s test. It enabled him to secure a rare triple only achieved once before; a century at Lord's in each of three special matches - the University Match (Oxford versus Cambridge), a Gentlemen versus Players’, and a Test match. Had it not been for the onset of World War Two and New Zealand’s low standing in the game at the time, it is fair to surmise he would have been classed as one of the world’s great all-time batsmen – England would have loved him in their eleven. It is no disparagement of Donnelly to say that in 1949 Sutcliffe was the more brilliant batsman. High praise indeed from the cricketing bible – Wisden, no less, considered him one of the world’s finest left-handed batsmen when summarising the 1949 New Zealand tour to England. Sutcliffe was only 25 when he made the tour, becoming the first New Zealander to amass 2000 runs on a tour – his 2627 run aggregate has been bettered only by Bradman. He hit a phenomenal seven centuries, averaging 60 in the test series and going past 50 on five of seven occasions. Sutcliffe formed a formidable partnership with Martin Donnelly on that tour – the two left handers often stood between their opponents and victory. The dashing pair forced England to rethink only offering NZ three day tests – in four tests the English could not overcome their contemporaries from the colonies. In 35 matches on tour New Zealand lost only one; to Oxford University. Sutcliffe showed a consistency that belied the fluent shot making he displayed for the majority of his career. At 18, Sutcliffe debuted at first-class level but his career was then put on hold when he volunteered for the Army towards the back end of the New Zealand summer. Upon his return to New Zealand, and first class cricket for the 1946-7 series, he scored a century in each innings against the MCC tourists and was immediately selected to play in his first test a week later - that test coincided with the last of English stalwart Walter Hammond. Sutcliffe had the honour of captaining his country in four tests against the West Indies and South Africa in the early 1950s though the leadership role was shared among many men throughout his international career. For all his exploits when donning the black cap, five test centuries amongst them, Kiwi cricketing tragics will most remember Sutcliffe for a knock of 80 not out against South Africa at Ellis Park in 1953. He took a fearful blow to the head and left the field with blood streaming from a wound. He later returned for a last wicket stand with Bob Blair, whose fiancée had tragically died two days earlier in the Tangiwai train disaster. After a six year hiatus he returned to the international game to finish his test career on a tour to India, Pakistan and England in 1965, aged 41. Bert Sutcliffe amassed more than 17,000 first-class runs at over 47, and hit two triple centuries during a career spanning some 26 years. He won the Redpath Trophy for first-class batting on three separate occasions, twice with averages in excess of 100 during the short Plunket Shield season. In 1953 he passed Roger Blunt’s record for most runs in New Zealand first class cricket. Awarded an MBE in 1985, Sutcliffe was the inaugural New Zealand Sportsman of the Year in 1949. The extent of his influence on the New Zealand game was clearly shown with the renaming of the BIL Oval to the Bert Sutcliffe Oval - the main ground at Lincoln, home of New Zealand’s cricketing academy. For all his achievements, and they were numerous, Sutcliffe never played in a winning New Zealand test side. These four pioneers of New Zealand cricket, along with a number of others, set a small cricketing nation on the path to future success. Without their exploits the gate may never have been opened for the likes of Reid, Crowe and Hadlee to shine in the world game. I’ll post the next two pieces in the coming weeks, detailing the other eight New Zealand Wisden Cricketers of the Year. I’d love to hear your recollections of these great players, and some of the stories passed down through generations – post a comment below or send me a tweet @aotearoaxi. If my research is wrong, let me know – this blog is primarily for me to develop a stronger understanding of where New Zealand cricket has come from, and the players who have shaped our great game. If you enjoyed it, sign up for email alerts for future pieces from a cricketing Buddha. Fabulous writing, ill pass this onto fellow NZers I know. Question for you : Who will be the next one? From the future tours programme it looks like NZ play a return series (after England tour here in early 2013)in England in late 2013, though I haven't confirmed the details. It is noted as including two tests (that isn't a series) so I doubt it's long enough to earn a spot in the little yellow book for 2014. In the fullness of time I think Kane Williamson and Doug Bracewell are New Zealand's best bets, though when they get the opportunity will be the biggest struggles - while NZ continues to rate as a second class test citizen there aren't a large number of chances to make the grade (I think you need at least a three test series). One point that will alsways irk me is than Dan Vettori is unlikely to make the grade, despite his enormous impact on world cricket. Like Inzamam, there seems to be an injustice in the process (as there are in all) at times. Being the 150th edition who knows what the criteria will be, it seems random. Maybe they will have 150 "misses"
A shocker that DV is not on the list! over through a dark and gentle sea.